Happy Friday guys and happy (almost) HALLOWEEN! It’s been a pretty solid week for me, and I’m so pumped for this weekend. We’re having some hallows-eve celebrations at work tomorrow, and I have a few costume parties over the weekend, as well as an ultimate girls night with the twin! What are you guys being for halloween?! 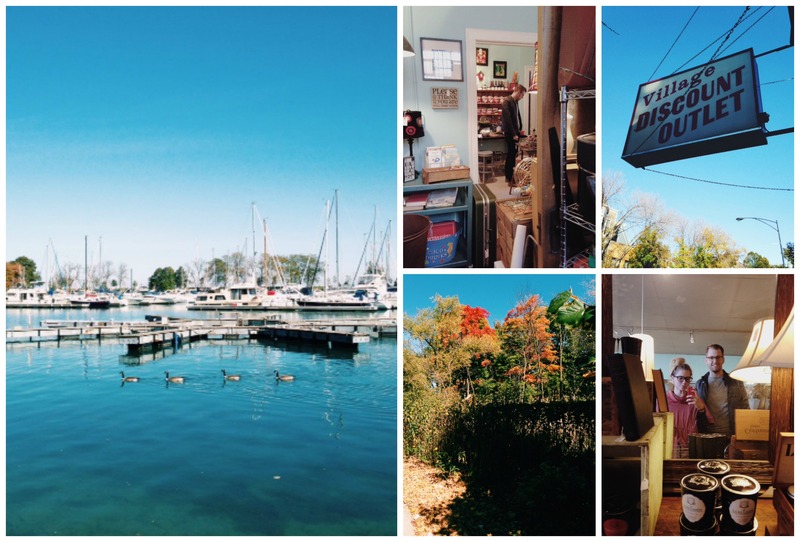 Calling my fellow Bloglovin’ lovers! Is it just me, or does it seem like vests are totally having a moment right now? I’ve been eyeing lots of them on my fellow Chicagoans, and I must say I’m green with envy. 1. This brown suede vest is on the top of my must-have list. I think t would really pull a lot of my outfits together. 2. I tragically lost my beloved denim jacket between moves, talk about heartbroken. I guess this one could cheer me up. 3. Still debating about this faux fur vest trend, do you guys think I could pull it off? 4. This puffy maroon vest looks like it could replace some of my fall jackets. 5. Loving the cut of this cute and casual gray number. 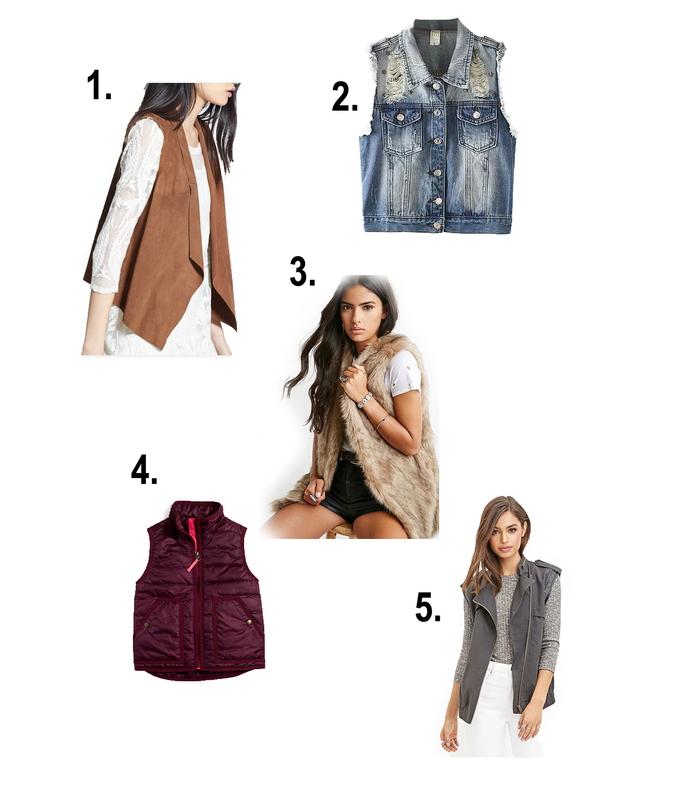 Which vest is your favorite?! 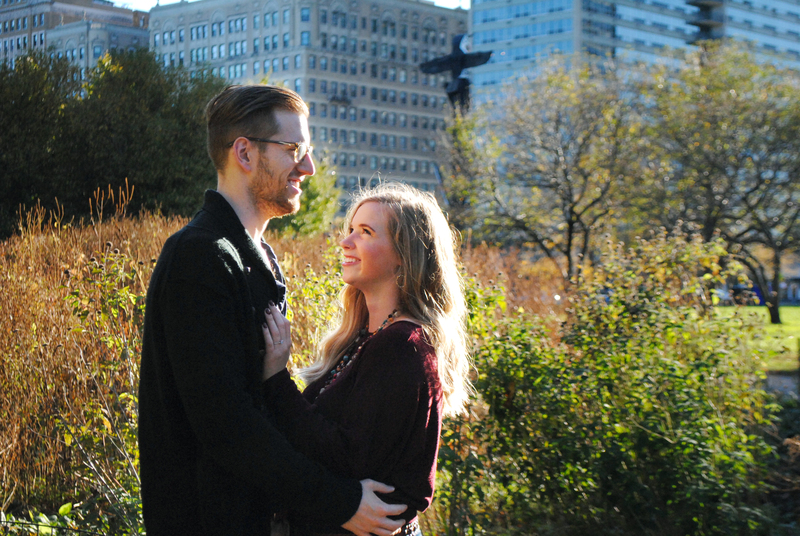 I made a new friend when I was 16, I started dating him at 17, I fell in love with him when I was 18, and now here we are – 22 and 23, and engaged. Gauging by different reactions people have had to our big news, I can tell some of them are a little weary of the idea of getting married “so young.” But here’s my beef with that, Logan and I got lucky, we really did! We aren’t the same people we were at 16, and neither is our relationship. Sometimes you meet an awesome someone that you can grow up alongside, mature into adults together, and create wonderful memories with. And that’s what I found. Our relationship isn’t complacent, nor are we “settling” for a high school love. Our relationship has had it’s set of challenges: we grew up in cities an hour and a half from each other and did long distance for not one, but two years. We eventually were in the same place for 3 years in college, and then we moved abroad and taught english in Spain for a year. We’ve traveled the world together, lived together, and even adopted our lil cat child together. We know each other inside and out, and I am really really really excited to keep on keepin’ on & marry this dude. So, while I can (kind of) understand people’s concerns about us being young, I’m here to tell you that you can worry about something more worthwhile, because we got this love thing down pat. How is it already Monday?! As the sun rises later and later it is getting exponentially harder for me to get out of bed, anyone else having this problem? At least I can reminisce about the wonderful weekend I had! * Date night at the super delicious Dry Hop! There’s no better way to spend a Saturday evening than sipping on a flight of craft brews. * My wedding venue crew included the fiance, twin, my mom, and my brother tagged along. * Every weekend includes some Luna lovin time. * Logan and I took some engagement pictures by our house, can’t wait to share them with you guys! * Not Pictured: I had a mini engagement celebration on Friday with some of my Chi-town friends, it was a blast! Did you do anything fun this weekend? TGIF!!! Is it just me, or has this week moved at sloth speed? I’m pretty excited for tomorrow and this weekend though. Because tomorrow I have some friends coming over for a little engagement celebration and Saturday the fiancé and I are looking at some wedding venues (shits gettin real)! What’s better than friends, drinks, and lots of catch up? PS Sorry that the lighting is so bad, I take these selfies at work aka florescents for dayz. 1. Mix & Match // This was my favorite outfit. Striped Baggy H&M Tee, Multi-color Leopard printed skirt. This weekend was a little less exciting than the last (engaged/married ladies know the post-proposal feelings). But it was still a great weekend in chi-town. * I invited a work friend to our weekly Whole Foods tradition (5 after 5), and it was greattt! It’s always a lil scary inviting new people out with your usual squad. * The Fiance’s parents came to town so we did A LOT of things on Saturday: we even saw our first wedding venue! * We went to Village Discount to hunt down some thrifty finds, but came out empty handed. * We also stopped by a super trendy second hand furniture store. Sadly, it was a bit out of our entry level pay grade. Whoops, as you can tell I forgot to snap a ootd selfie twice this week. 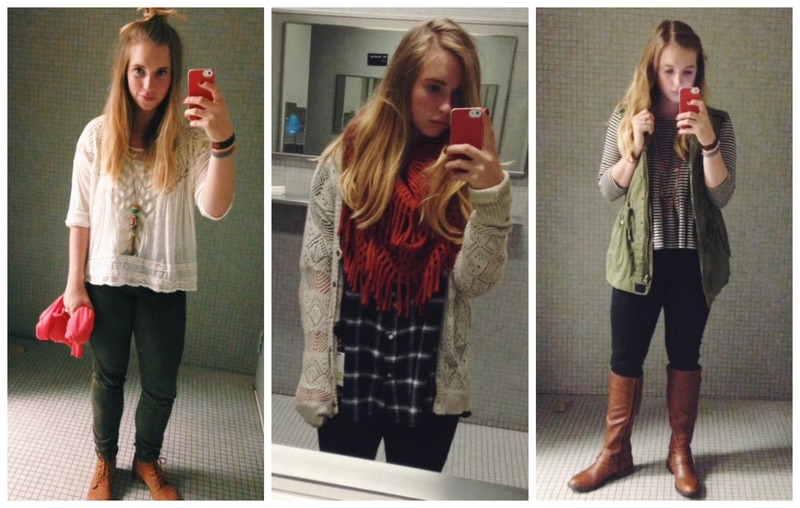 So I give you three of my outfits from the past 7 days. 1. Folky hipster // Olive green corduroys (pacsun), a dainty white top (thrifted), and a coral colored cardi. 2. Lady Lumberjack // Leggings, oversized plaid top (Old Navy), crocheted cardi (thrifted), and lion-like infinity scarf (akira). Which outfit do you like best?! Now that temps are finally dipping down into the 50s, it feels like fall has finally arrived! And with these low temperatures, I’m reaching for all things comfy and cozy! I found all of these on this awesome site shein. I didn’t think it was a super legit shopping site (a too good to be true case), but my sister recently ordered from them and everything was a pretty good quality, and she got the package pretty quickly! Score! 1. 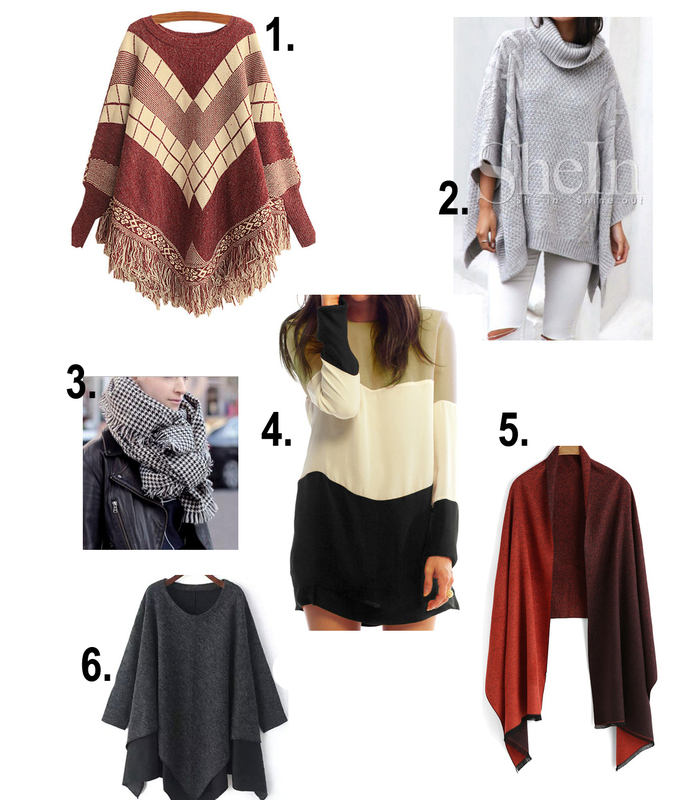 DYING for this geometric maroon poncho, I can just see myself cuddled up in it every weekend. 2. Similar to number 1, but long enough to wear with a pair of leggings. I like the cowl neck, and I don’t think it would feel like a tiny leprechaun is choking me all day (I’m looking at you turtle necks). 3. I have one blanket scarf, but living in Chicago in the winter means I need like 8 of these on rotation. The houndstooth print on this one would go great with everything in my closet. 4. Color block is still in, and I love this simple dress with autumn inspired colors. 5. How amazing does this ombre scarf look?! I think it’s #1 on my scarf wish list. 6. Last, but not least, another poncho inspired top that would look great with riding boots, and a pair of printed leggings. What are you currently craving?! I’m so so so excited that I’m engaged to my BFF. It’s kind of crazy that he’ll be my husband pretty soon (no, we don’t have a date yet). I can already tell this engagement time will be SO fun! I can’t wait for all of the memories and celebrations this next year has in store for us. The amount of love and support the fiance and I have received since our engagement has been nothing short of amazing. I feel so loved by all of my friends and family. Literally the best feeling. So I guess we have to plan a wedding now… How does one even plan a wedding?! Hahaha, I’m sure once we get the venue it’ll be a lot less daunting. Feeling lucky that I found someone who loves me so much that he wants to spend the rest of his life with me. We came into each other’s lives so long ago, and have really grown up alongside each other, I just feel so lucky to have met such an amazing dude. Every time someone asks me to tell the engagement story, or gushes over my ring, I can’t help but feel SO giddy about it. I catch myself picturing myself walking down the aisle with my dad, exchanging mushy, meaningful vows with Logan, and celebrating a huge day with all of my favorite people. It’s just so freaking exciting!